Published: 20th February 2013M / 9 Rabiulakhir 1434H, We. Assalamualaikum warahmatullah. 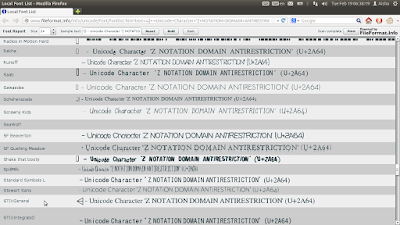 My husband wanted to use the Z Notation domain antirestriction symbol, see Pic 1, in his assignment. I was unable to do a thorough search in the list of fonts in LibreOffice Writer because the Special Character dialog hang for unknown reasons. Up to that point there was no similar symbol to be found. I shutdown his laptop then moved-on to my laptop to do an online search. ... I finally found the symbol. See Pic 2. Pic 2 - List of math symbols, before installing the necessary font. In the rightmost column are images of the symbol. 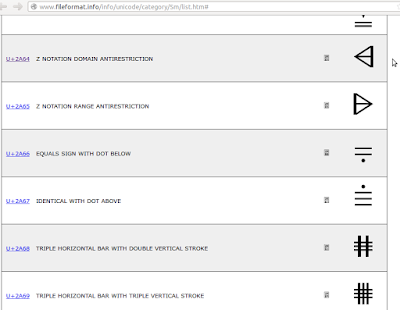 In the column next to the images are the symbols as displayed by the browser. The unsupported symbol will look pixeled like in Pic 3 while the supported symbol will look smooth like in Pic 4; that is unless the symbol is originally created to have a pixeled-look like the GNU Unifont in Pic 6. "You don't have the font in your system so the symbol is not displayed correctly in the browser." "You have the font in your system so the symbol is displayed correctly in the browser." Proceed if you need to install the font. Pic 3 - Unsupported. Pixeled. From the FileFormat.Info website. Pic 4 - Supported. Smooth. From the FileFormat.Info website. Pic 5 - Checking local fonts, after installing a font that supports the symbol in Pic 1. Prior to this post, no fonts in my system can display the symbol correctly. So a font that supports this symbol needs to be installed. 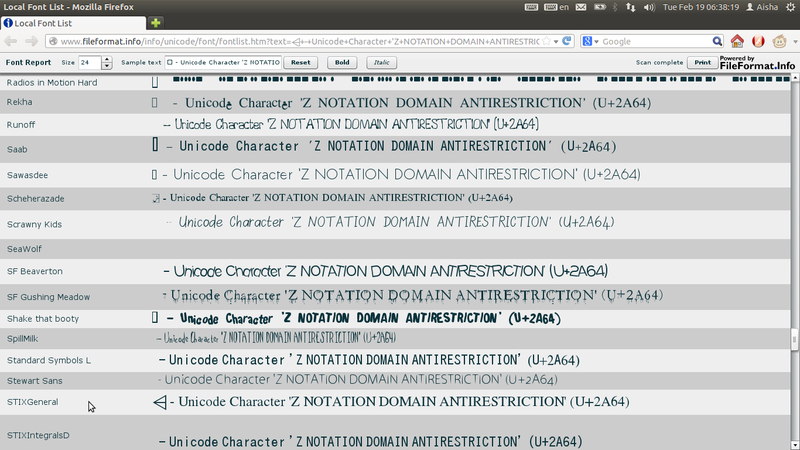 Pic 6 - Among the fonts that support the Z Notation symbols. From the FileFormat.Info website. Note that only the bolded fonts are available in Ubuntu Software Center. In Part C, I chose to use the STIXGeneral-Regular font. The search results will auto-filter. Pic 7 - Refer to Step 2. Searching for the package. ... package. See Pic 7. A. Click the Install button (see Pic 7) to install right-away. B. Click the More Info button (see Pic 7) to read more about the package and click the Install button later. See Pic 8. Pic 8 - Refer to Step 3.B. 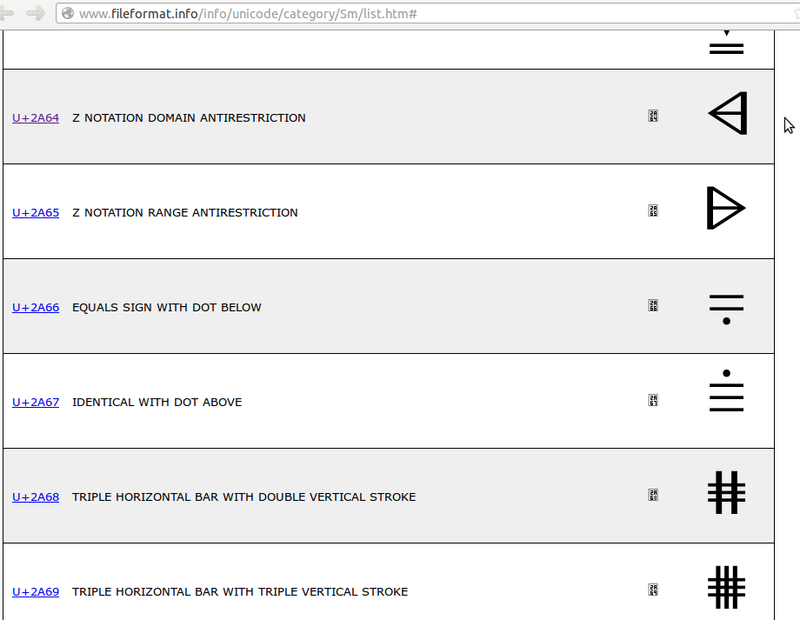 More information about the STIX (Scientic and Technical Information eXchange) font package. 4. The Authenticate dialog will pop-up. See Pic 9. Enter the password in the Password: field then click the Authenticate button. Allow the installation process to take place. Pic 9 - Refer to Step 4. Authenticating the installation. - try-out the newly-installed font in LibreOffice Writer.